Finnish handset maker Nokia has added yet another model to its successful Asha series. 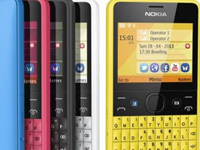 The tech giant has unveiled Nokia Asha 210 targeting the youth which relies more on texting and has a lower budget. The phone comes with a QWERTY keyboard and also supports Facebook, Twitter and Gmail. The phone is expected to be priced at sub Rs 4,000. Asha 210 sports a 2 mega-pixel rear camera (resolution 600 x 1200 pixels). Available in both single-SIM and dual-SIM, the phone boasts of 46 days with Single-SIM and up to 24 days with Dual-SIM. It has a talk-time capacity of 12 hours on 2G. The shipping the phone is expected to start from the second quarter of 2013.